I just finished reading this book the other night and all I can say is that it’s an amazing book! For me, the first half was good, but the second half (and especially the last quarter of the book) was awesome. I’m already a big fan of Stephen King (my current favorites being the Dark Tower series) but I think this would be a close second. So, this is a book about time travel first of all, with a little romance thrown in for good measure, some horror, and throw in a little murder just for fun! It’s seriously got a little bit of everything (also some history) and I think that anyone could appreciate this book! Just a very short summary (I don’t want to give anything away)…. 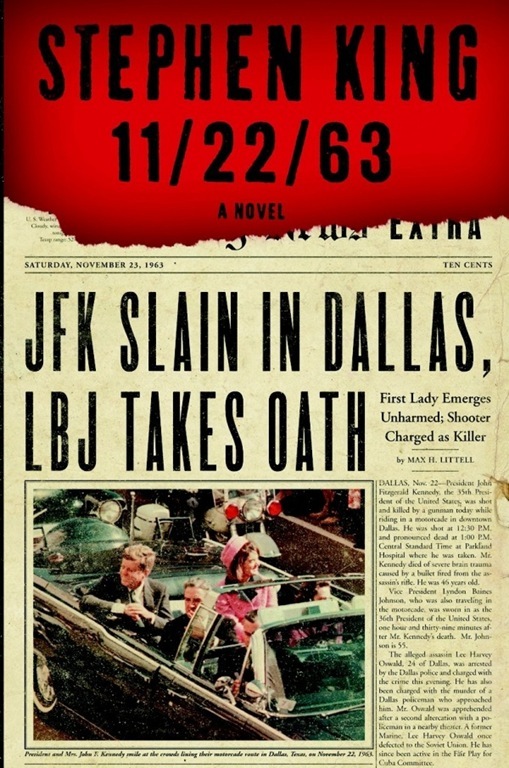 Jake Epping goes back in time to try to stop the murder of JFK, and ends up trying to change history (for the better) in a few smaller ways as well. There’s an unexpected twist at the end that makes us wonder….is avoiding a tragedy always a good thing down the road? You’ll have to read to find out what happens!